After ten years of talking about having children, two years of trying (and failing) to conceive, and one shot of donor sperm for her partner, Amie Miller was about to become a mother. Or something like that. Over the next nine months, as her partner became the biological mom-to-be, Miller became . . . what? Mommy’s little helper? A faux dad? As a midwestern, station wagon-driving, stay-at-home mom-and as a nonbiological lesbian mother-Miller both defines and defies the norm. Like new parents everywhere, she wrestled with the anxieties and challenges of first-time parenthood but experienced pregnancy and birth only vicariously. Part love story, part comedy, part quest, Miller’s candid and often humorous memoir is a much-needed cultural roadmap for becoming a parent, even when the usual categories do not fit. 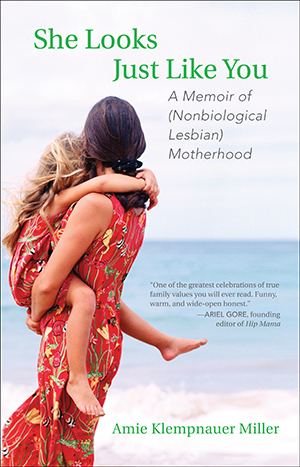 "She Looks Just Like You: A Memoir of (Nonbiological Lesbian) Parenthood, by Amie Klempnauer Miller, is a heartfelt chronicle of becoming a mother and navigating the first year of parenthood with her partner. Miller has managed to find a thoughtful balance between the things that set nonbiological lesbian parents apart and the things that bring all parents together." Aimie Miller on KPFK's Uprising; click here to listen.